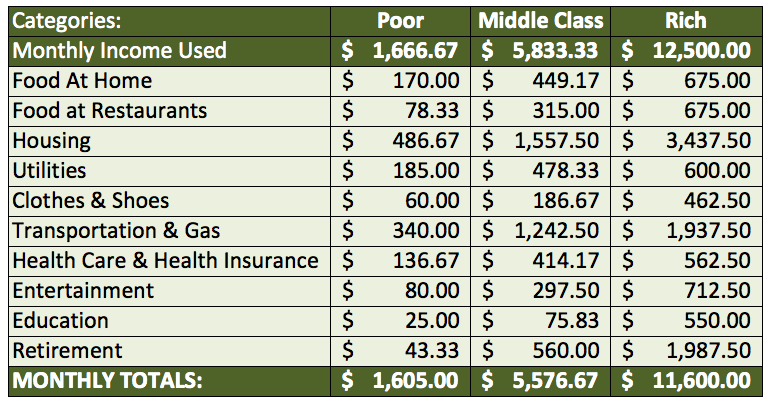 The Poor versus The Rich: Spending Habits | Save. Spend. Splurge. 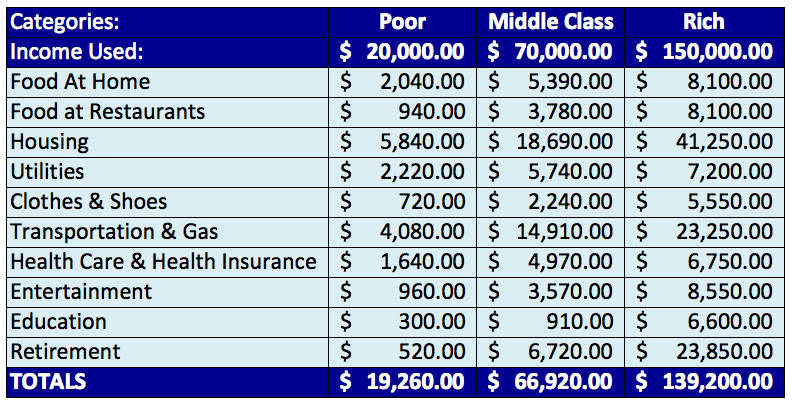 Poor versus the Middle Class and the Rich infographic. These amounts are also by YEAR, not month. Infographic credit: FastCoDesign who also writes a great commentary on the above. It is also no surprise to me that the Poor spend the most amount of money on Food At Home, and the Rich spend the least (although the Rich’s “least” spent is $8100/year or $675/month). Although I daresay it isn’t such a bad thing for the Poor to eat at home, they are most certainly not able to spend their meager grocery budget on organic, fresh foods, which I suspect is where the difference is in those food budgets between the Poor and the Rich. Everything just costs so much more for the Poor in terms of how much it eats up of their budget just to cover the basics. Where can you really afford to cut in such a budget?! The totals don’t add up to 100%, but the authors noted that there were discrepancies. 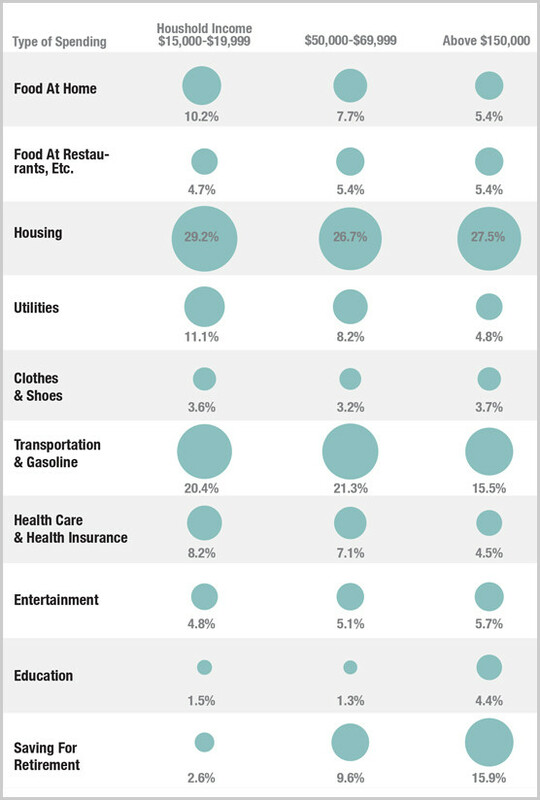 Housing and Transportation and Gas are the two most common categories. The poor have to prioritize utilities over other parts of the budget, but the Middle Class and Rich save quite a bit for retirement in comparison. The amounts are easier to understand when they’re broken down by month. The Rich put approximately $1350/month of food into their mouths each month, which is almost the entire monthly budget of the Poor. For the Rich, they are spending almost 12X more on average versus the Poor (multiplier ranges from 4X to 45.8X more). The biggest multiplier is the Retirement for the Poor at $43.33 dollars a month versus the Rich at $1987.50 a month which means they are saving 45.8X more a month. Naturally, we feel the urge to judge them and say: Well, just take the $78.33 they spend in Food on Restaurants and put some more into Food at Home, and the rest into Retirement! I’d agree with this, but would you, if you were in that position really have that kind of foresight to do that? 1) I am fairly sure they aren’t crunching those numbers like us personal finance geeks. 2) They just want to have a break and a treat once in a while like anyone else, except they don’t realize that they can’t afford it. It’s very easy to say what you would do, but it’s a lot harder to execute on such a tight budget. Even looking at those numbers, they seem low. Minimum wage is around $7.25/hour if I am not mistaken. These people obviously NEED to share housing with a roommate or 7 to be able to have shelter unless they’re living in the middle of nowhere, which means their Gas/Transportation costs will go up accordingly. ….and the IRS really thinks that people can live on $534 a month on a budget without Housing factored in!?!? Even if you remove all the borderline-luxurious categories like Food At Restaurants or Entertainment, just the Transportation and Utilities alone ($525) will almost eat the entire IRS-proposed budget. So what about Healthcare? What about Education? They still need a minimal budget for Clothes too! As this blog is clearly all about ME 😉 — I am rather pleased with my numbers against the Rich category. *This would change if I had a car, which I am not opposed to buying. I just haven’t seen a need for one yet and Public Transportation is so much cheaper when you think about Insurance, Parking, yadda yadda. These numbers motivate me and make me think more about my own spending and especially my saving. 2012: $17,500 (Estimate) <– I am hoping so hard for this! I could certainly save more especially at my income level, I’m sure. Actually, I could just stand to work more, but I think traveling (on a fairly cheap budget) is something that should be done when you’re young, especially given that I can afford it and I want to do it, knowing the consequences. What do you think about the numbers above? Do they motivate you? Discourage you? Any other observations? Perhaps, but the percentages are also based on different salaries. They have more than 5X for that budget as ‘Rich’. I was thinking about the opposite… that if the poor can spend only $720/year, it means the Rich could spend less! I really like how you broke everything out and commented on the dollar value, as opposed to just the percentage of income. In a way, this information shows that there is truly even more of a gap between the rich and the poor – and it’s very difficult to break the cycle of poverty. I can only judge things once I see them in $. Otherwise, as percentages, it’s interesting for a general overview, but not indicative of the actual spending. First observation: that state map is a bit misleading – there are even more areas of the country that should be shaded navy (Chicago and Atlanta jump to mind). Second, $20,000 is a strange income to choose. At $20,000 is a strange number to calculate this on. In most states that’s too much for two people to be eligible for food stamps. (Unless we’re talking a mother and young child.) The difference in educational spending is really what’s sticking with me- “cyclic poverty” really comes to mind based on that number alone. Bah- wrote this quickly and forgot to edit! That state map comes from data that they collected — do you have another map with data that says that Atlanta and Chicago are supposed to be darker? What’s the income for food stamps?? I don’t have another map; it’s just that Chicago and Atlanta are two examples of expensive metros in states with relatively low costs of living. It varies by state, but in mine you’re eligible for the full amount ($200 for an individual) up to about $13,000/year. For two people, it’s $18,5000. Hmm.. Maybe they used 2 people in a household for the food stamps? Even so, it doesn’t reach $19,999. But maybe it’s not a food stamp category, but more of just a “poor” category. I think the key to increasing one’s financial stability is minimal to moderate increases in lifestyle expenses whenever large increases in income occur. My annual income more than tripled a few years ago putting me comfortably in the rich category according to your chart above, but my living expenses only went up by maybe 25% with all the rest going to retirement and travel. I can’t fathom how a person can spend $8000 a year eating at restaurants. I still eat the same food I ate when I had a more modest income, mainly because I don’t want to get fat. Someone in the “poor” category doesn’t really have too many options except to find a way to climb the social ladder and make a better income. Ditto. My income had gone up significantly since I started working. Now, I just work less, make a decent amount of money, save it (at least, I try my best to stay down at the levels I was before), and try to be moderate in my life….. Although I was thinking the other day that it wasn’t very moderate or normal for most people under 30 to be taking off so much time to travel and do whatever they want instead of working like crazy to save. My priorities lie elsewhere, I suppose. I feel like I can always make more money, but my youth and all the time I’m given now (pre-children), can never be saved to use later. 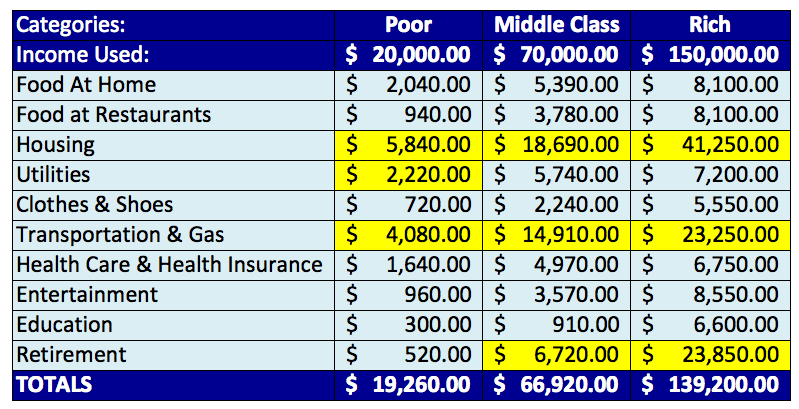 I was looking at the middle class column thinking I was doing pretty good in all categories until I realized this was $70,000 after tax, not before. Oops. My housing costs are significantly out of whack from this infographic, but that’s to be expected. If I was paying the mortgage payments required by the lender, I’d be 3% over the average for middle class. Instead I’m paying my mortgage accelerated biweekly, with an extra 20% on the principal, so I’m actually around 38.5%. I’m also high on the retirement end, with 15.6% of my after tax money going into retirement accounts. Everything else I’m low on, especially the transportation costs. Even if I was to buy a new car, I’d still be below average. That being said, this is for a family, and I’m just an individual. I’m surprised they don’t have a column for non-retirement savings. I also found it odd they didn’t have a NON-retirement savings section, but perhaps they just assume that if you are able to save outside of retirement because it’s all maxed, there’s really no point in counting it as an expense.